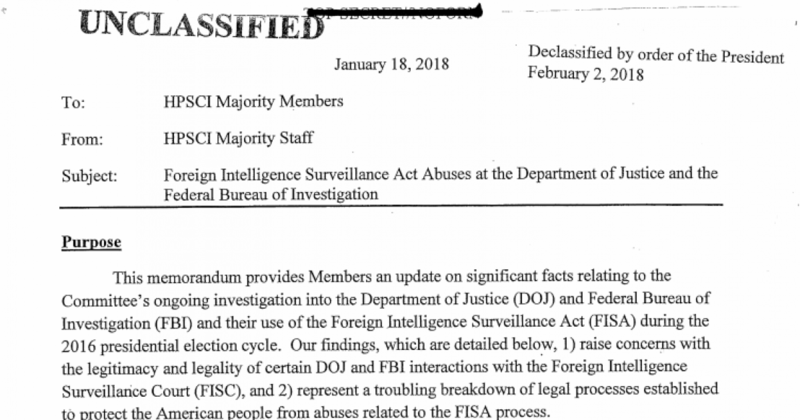 Here is the House Intelligence memo. The dossier authored by Christopher Steele was “an essential part” of the FBI and the Justice Department’s justification for conducting electronic surveillance of Carter Page. It also notes the dossier was funded by the DNC and Hillary Clinton’s campaign. This “clear evidence of Steele’s bias” wasn’t reflected in any of the applications to authorize the electronic surveillance. One more thing: The memo also says that information about Trump campaign adviser George Papadopolous “triggered the opening of an FBI counterintelligence investigation” in July 2016 by Peter Strzok, one of the FBI agents who later got in trouble for texts about Trump and Clinton.